I’ve commented before on how keen I am on making my own spice mixes. 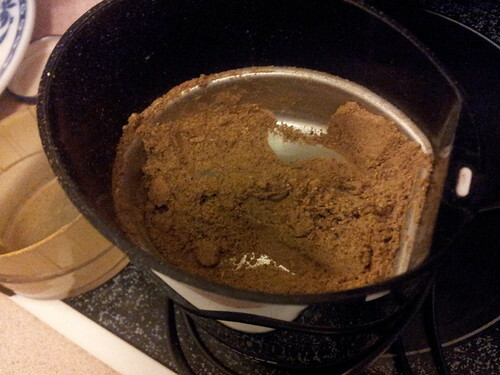 Our most recent batch of garam masala was bought from a spice store, in a huge quantity, and turned out to be far too rich in cinnamon for my liking. Is cinnamon even supposed to be in garam masala? Ras el hanout is a Moroccan spice blend that you may struggle to purchase, leaving you with no option but to make it yourself. It’s ultimately a personal blend and in Morocco no two shops are likely to sell the same product under its banner. I have based this recipe on that found in Made in Morocco but did a little tweaking because I was in a bit of a rush. Give it all a good whizzy up, so that it’s a uniform mix, and store in a jar. This will make about ¼ cup: with spice mixes it’s always best to make them in small quantities unless it’s something you use tons of. Also, if you’re working on finding your perfect blend, make sure you write down what you did so you can make adjustments next time. I was pretty happy with this – I could have faffed around toasting spices (and the original recipe does mandate that) and I probably will do that in future, if I’m less pushed for time, but other than that, there aren’t any adjustments I’d look to make. Once you have this, you’ll find plenty of uses for it … but the most simple perhaps is to mix a couple of generous teaspoons through some plain flour and use that to coat garfish fillets before quickly pan frying them. Not only does it add a subtle flavour but the turmeric adds a gorgeous golden glow to the fish.